Tattoo, the country’s most reliable mobile broadband, welcomes you to the tablet age with the finest and most affordable bundle plans for your tablet devices. With the Tattoo Tablet Bundles, get three free devices in one amped-up plan harnessing high-speed mobility and connectivity all in one super-power bundle. More than that, Tattoo also allows you to maximize the features of your tablets by offering ultra-fast internet speed. of 7.2 Mbps giving everyone a great tablet experience both for personal and business use. Offering the synergy of unlimited internet browsing and mobile text and calls is Tattoo’s Tablet Bundle starting with Plan 1298. 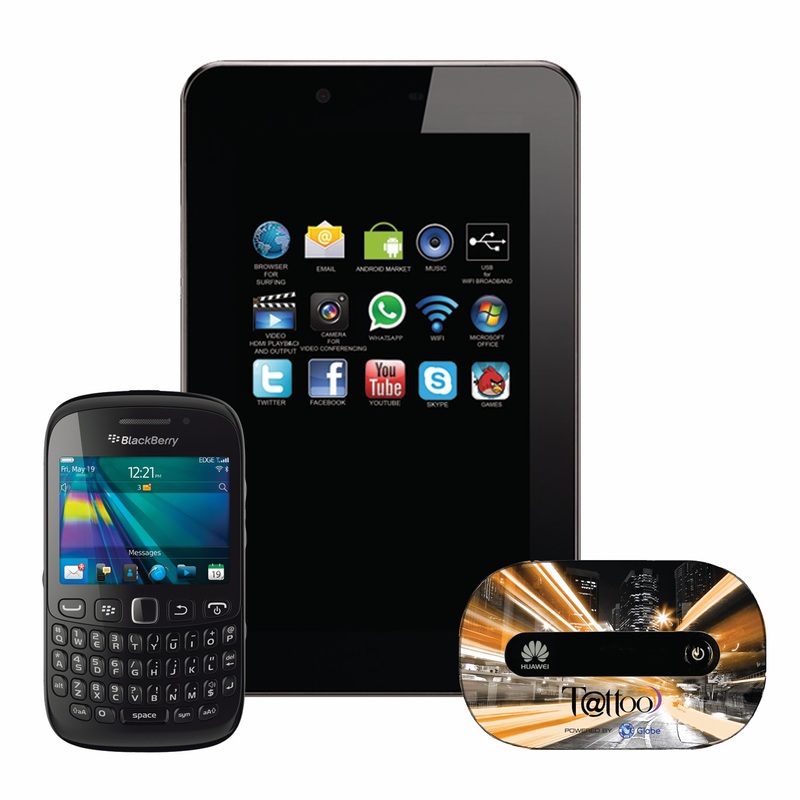 Coming with three free supercharged devices—a free Skyworth S73 tablet or a Cloudpad 705W, a Blackberry Curve 9220 mobile phone, and the country’s fastest broadband Wi-Fi stick which can power up to ten devices, Tattoo Bundle Plan 1298 gives you the experience of seamless connectivity wherever you are. The Tattoo Bundle plans combined these three powerful communication devices together to answer the increasing need to always stay connected. With more and more people going mobile, the Tattoo Bundle plans allow you to manage and share more so you are always in touch and always available. “Tattoo is the authority when it comes to tablets. We have proven this already as we introduced our very first branded tablet with the Mediapad. Since then, Tattoo has always been exciting the market with compelling offers. This time Tattoo gives subscribers more ways to stay connected with a complete bundle – a tablet, a phone and a mobile WIFI device that gives seamless connectivity only from the country’s most preferred broadband" said Dong Ronquillo, Vice President, Globe Tattoo Nomadic Broadband Business. Other Tattoo Tablet bundles are also available with varying numbers of free browsing hours together with unlimited calls and texts on the free mobile phone and connectivity through the free mobile wifi. Plan 998 has 85 browsing hours coming with a Cloudpad 705W for a one-time cash out of P1499 and Blackberry Curve 9320 phone; Plan 798 also has 85 browsing hours coupled with a Skyworth S73 for a one-time cash out of P1499 and a Cloudfone Excite 352G; Lastly, Plan 598 includes 50 browsing hours, a Cloudpad 705W for a one-time cash out of P2999 and a Cloudfone Excite 352G. Together with the new and exclusive Tablet Bundles, subscribers can also choose from Tattoo’s other dynamic Tablet-only offers that also come with its very own mobile wifi device. With a wider Tablet portfolio, Tattoo offers models that range from the Cloudpad 705W for one-time low cash out of P499, while the hard-working Skyworth S82 and the Cherry Fusion Bolt tablets come very affordable for a one-time cash out of P999. Android-disciples can also get their hands on the popular Samsung Galaxy Tab 3 10.1 at the unbeatable low price offering of P12, 999. From reading, surfing the net, sending emails or just simply playing online games with your tablets on your commute, to unlimited calls and texts and mobile internet connection, the Tattoo Bundle plans give you the best deals in the market today. Get into the tablet revolution and arm yourself with the most powerful trio only from Tattoo.